My imagination quickly conjured up and placed directly in front of my mind’s eye, an image of something that made the thought of eating honey a little less palatable. “Bees regurgitate the nectar and then pass it to another bee.” he continued. You may have heard honey referred to as bee spit, however, this is not technically accurate as we will see as we look closer at the actual process bees use to make honey. Most people know that it’s the workers, or field bees, that collect the nectar which is then turned into honey. Tens of thousands of workers make up the “heartbeat” of the colony. Because they all require honey as a food source it’s easy to picture honey as the lifeblood traversing through the collective veins of the colony. So just how do bees go about making this sweet stuff that humans have been hunting and collecting since the beginning of time? If you’ve ever sat in front of a bee hive and watched bees come and go you may have noticed that in the morning it seems like the only thing the bees are bringing in is pollen. Bee after bee returns to the hive with its pollen baskets laden with varying colors of pollen. “So just where is the nectar for making honey?” you might ask. Most plants don’t begin to produce significant amounts of nectar until they have a chance to warm up in the morning sun. Once warm, the nectar begins to flow. So the field bees collect pollen while they wait for the nectar to become available. Pollen provides the protein needed to raise young and a varied mix of pollen is just as important to the colony as is honey. One fascinating aspect of nectar collection is that an individual field bee only collects nectar from the same color and species of flower. She is not distracted by other plants and their flowers, even though those other flowers may be rich in nectar. In videos that track a honey bee’s flight from flower to flower, the bee might begin her search for nectar by stopping at a blue flower. After leaving the first blue flower she proceeds to fly over a field of other brightly-colored flowers in search of the next blue flower. And it’s not just any blue flower but the blue flower produced by the same species of plant. This makes the nectar collecting trips for the field bee more efficient. The bee does not have to stop and waste time checking various flowers to see if they contain nectar, but already knows the specific species of plant with the blue flower is producing nectar. Not all field bees will be collecting from the same plant if more than one plant is producing nectar. Other field bees will be collecting from other species. The field bee stores the nectar it collects in her honey stomach, but it’s not a true stomach in that no digestion occurs there. The honey stomach is similar to a crop and holds the nectar until the bee returns to the hive. At the hive the nectar is regurgitated back to the mouth (thus the term “bee spit”) and given to another worker bee within the hive. Nectar has a high water content (up to 60 percent) and removing the water is one of the first steps the bees must take to convert the nectar to honey, which normally contains 18 percent water. 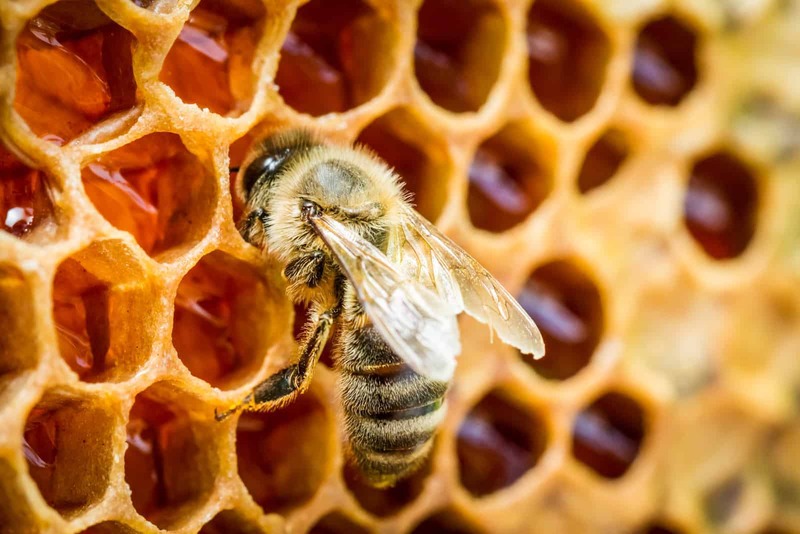 Beneficial bacteria (lactobacillus) living in the honey stomach are added to the nectar, as is the enzyme invertase via the bees salivary glands. 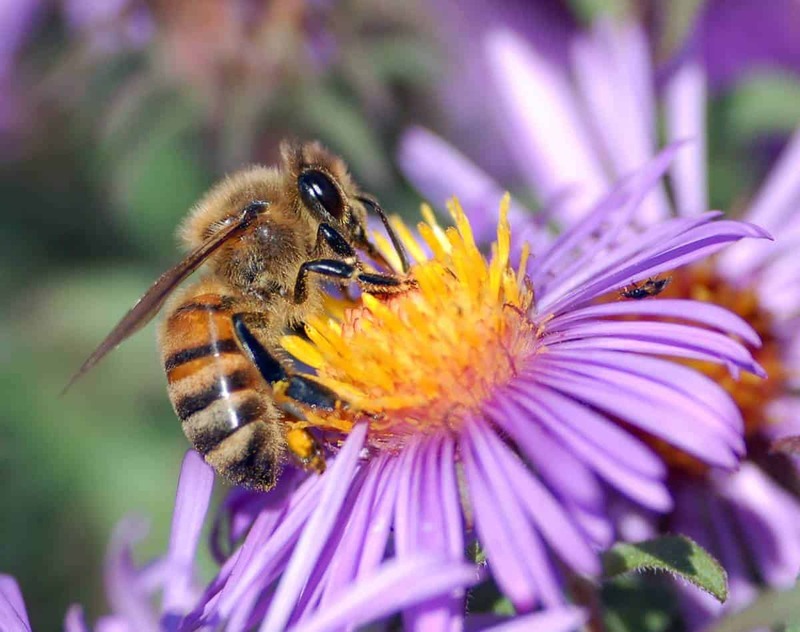 To process the nectar, house bees receiving a portion of the nectar from a field bee will seek out a quiet place in the hive to further the process of converting the nectar to honey. After regurgitating a portion of the nectar to their mouth parts, the house bee adds more invertase to break down the sucrose molecules in the nectar into two simple sugars, glucose and fructose, to produce a small bubble. The bubble creates a greater surface-to-volume ratio and comes into contact with the warm air inside the colony, evaporating water from the nectar. The bubble will then be taken back into the honey stomach to be mixed with the remaining nectar and enzymes prior to producing another bubble. The house bee will continue this activity for several minutes to process each stomach load before the next phase of nectar ripening can continue. In the next phase of nectar ripening the house bees will begin storing the nectar droplets in beeswax cells where passive evaporation will continue the drying process. The ripening process continues in the warm hive environment and is facilitated by house bees fanning their wings to circulate air and increase the rate of evaporation. Reducing the water content lowers the volume of the nectar by half, allowing the bees to store more honey in less space. It also concentrates the volume of sugars, which creates an environment that is inhospitable to organisms capable of spoiling the final honey product. The enzymatic action (invertase) that breaks down the sucrose into glucose and fructose is the process that chemically changes nectar into the product we know as honey. The enzyme glucose oxidase is also found in honey and it converts glucose to gluconic acid and hydrogen peroxide. These compounds provide the ripening honey with antibacterial properties and high acidity – a hostile environment for bacteria – resulting in a honey product that will not spoil. Other compounds found in honey in trace amounts are calcium, chlorine, copper, iron, magnesium, manganese, phosphorus, potassium, silica, sodium and sulfur. After the moisture content of the honey has been reduced to approximately 18 percent the bees will cap it under a thin layer of wax. There are two types of capped honey, referred to as “wet” and “dry”. 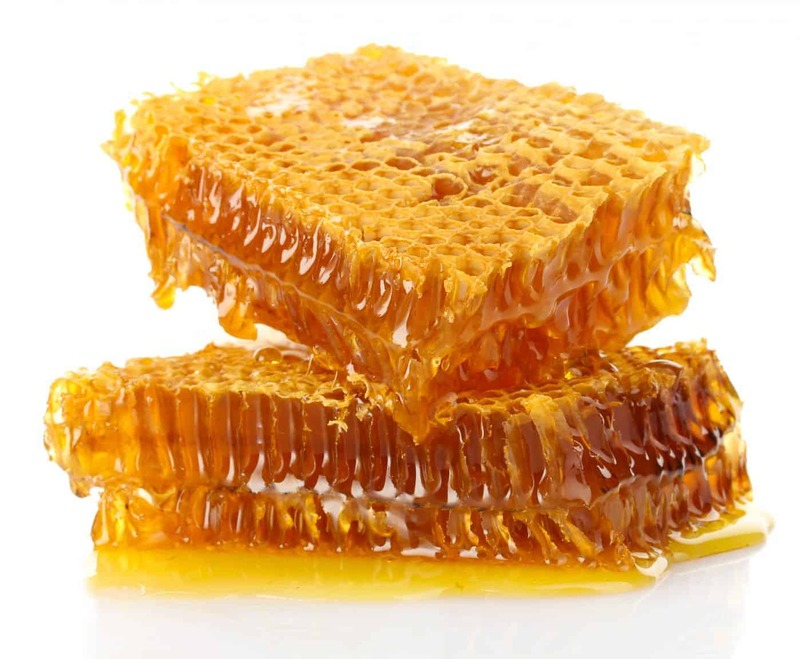 Dry capped honey is what many of us are familiar with and is most desired by consumers. It is the honey comb most often pictured in books that appears white. It appears this way because the bees leave a tiny air space between the wax cap and the honey so that the two are not in contact. Wet capped honey appears dark, for the simple reason that there is no air space between the honey and the wax capping. There is really no difference between wet and dry capped honey other than the fact one contains an air pocket and one does not. At the end of the summer, if it’s been a good season and your bees have stored plenty of honey to see themselves through winter, the beekeeper may have the opportunity to harvest a bit of the bees labor, enjoying some fresh golden honey over the course of the coming winter. The beekeeper will only want to harvest honey that is fully capped to avoid fermentation. Fermentation can begin when the honey reaches a moisture content of 18.6 percent, but can also be prevented by storing the honey at temperatures below 50 degrees. The ideal temperature for honey to granulate is 57 degrees. Honey is hygroscopic and can absorb moisture from the air. Inside the hive the bees control the hive environment to ensure fermentation does not begin. It’s also why they reduce the moisture content to about 18 percent prior to capping. It’s worth pointing out that liquid honey will eventually granulate. Honey that contains a greater proportion of glucose to fructose will granulate faster, because glucose is unstable as a liquid and will naturally form crystals. Too often the consumer considers granulated honey spoiled and ends up throwing it away, but it’s actually fine to eat and some folks prefer it that way. Granulated honey can be re-liquefied by gently warming it in a pan of water such as a double boiler. Keep in mind that too much heat or even extended gentle heating can darken honey and reduce its quality. Honey is available in three styles: extracted, comb and chunk. Most of the honey sold in the United States is sold as extracted honey. Extracted honey is also sold as “creamed honey”, which is a crystallized honey with very fine crystals that give it a feel in the mouth more like butter. Comb honey is sold in sections of wax comb that are still filled with honey. Many people enjoy taking a bite of comb honey and chewing on the wax. Another style is chunk honey, which consists of pieces of honey-filled comb that is placed in a container and then the container is filled with extracted honey. Look for both comb and chunk style honey at farmers markets and road side stands in late summer or fall. It’s always worth mentioning that honey should not be fed to infants less than a year old. Spores of the bacteria Clostridium botulinum commonly exist throughout our environment and are able to survive in honey. The spores may be able to reach the vegetative stage of their life cycle in the digestive tracts of infants and produce toxins that could be injurious to them. Finally, no discussion of honey would be complete without a short advisory to beginning beekeepers. In the excitement of their first season of beekeeping it’s not uncommon for the new beekeeper to remove too much honey from the hive and starve an otherwise thriving colony over the course of the winter. It is the wise beekeeper who errors on the side of caution the first season and takes note of the amount of honey left in the hive at the end of the season. When spring comes it will then be possible to see how much honey was required by the colony over the course of the winter. By doing so you will gain an understanding of how much honey can safely be remove from the hive when the next season rolls around. All beekeeping is local and it’s important to know your bee’s requirements for your particular area.